A team of volunteers from across Wrexham Glyndwr University have joined forces to support the Great British Spring Clean. The team – which drew on staff from across the University’s departments and from the Techniquest Glyndwr science discovery centre – helped to spruce up hedgerow bordering the university’s Plas Coch campus by taking part in a litter pick. In total, fifteen bags of rubbish were tidied from along the busy Mold Road route into Wrexham which passes the university. 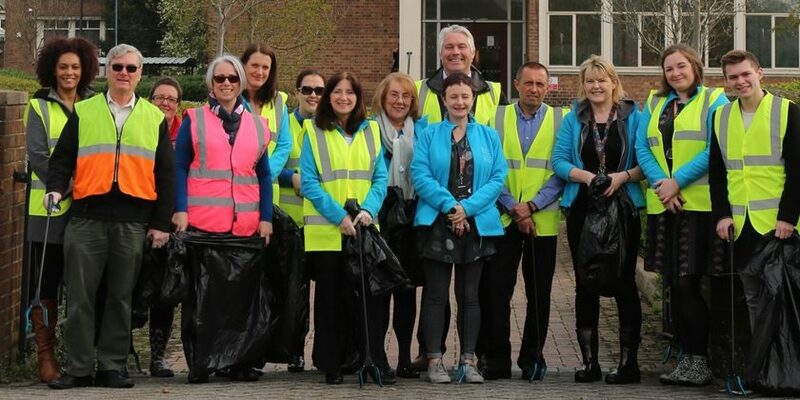 The event was part of Keep Britain Tidy’s Great British Spring Clean, which runs from 22 March to 23 April, and follows a number of other events run by the university where staff have helped to keep areas around the university’s various campuses tidy. Wrexham Glyndwr University Director of Operations, Lynda Powell, was among those staff who rolled up their sleeves to take part in the event. She said: “As a University, we work closely to make sure that our institution is following sustainable principles. “We are committed to managing our impact on the environment and have dedicated ‘Green Champions’ working to ensure all our staff are environmentally aware. “That commitment runs across the university, and is aimed at both large-scale changes, such as energy saving systems, and the smaller, day-to-day changes we can all make – such as today’s litter pick. More about Wrexham Glyndŵr University’s work on sustainability – and how staff and students are involved in that work – can be found here.